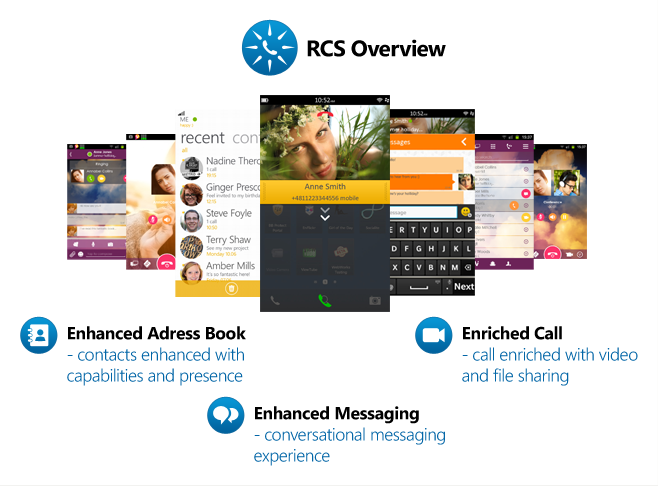 RCS enhances consumer VoIP services by adding a whole suite of new features going beyond voice and simple text communication. The emphasis is on a contact oriented approach where a user can not only initiate conversation but can also see his contacts interest, mood, location and willingness to communicate. VoipSwitch’s RCS is a complete platform consisting of a mobile and desktop clients and the server part with RCS node. In addition there is an RCS Portal offering all RCS features directly from a browser. It supports also WebRTC for audio and video calling. The RCS backend network elements are responsible for all ONNET (free) communication and special features while paid services are realized by a separate softswitch and billing system. This separation of RCS node and softswitch allows for integration not only with the VoipSwitch’s class 5 softswitch but also with most of 3rd party softswitches. The system has been deployed so far with several popular class 5 softswitches as well as calling card platforms. Rich Communication Suite Client brochure.